SYNDICATE FULL: WAITING LIST AVAILABLE. Email as per below. Following hot on the heels of geegeez' recent syndication of East Wing, an untried National Hunt 'store horse', I'm delighted to offer shares in another horse, though this one has a quite different profile. This will be the last such syndicate for some time, so if you might be interested do please read all of this post. East Wing, like The Geegeez Geegee at the same stage in his career, has never raced before and is learning everything about being a racehorse at the moment prior to a first rules run around the turn of the year. The new lad is, as I say, a different proposition. He comes to us from the flat, where he was good enough to be rated 80 at his peak, and he's still rated 75 in that discipline. So, while it's possible he could be a dual purpose type (already a winner on the all weather), what excites us most is his scope to jump a hurdle. His name is Dragoon Guard. By Jeremy - the same sire as the ill-fated but brilliant Our Conor - he's bred for stamina on the dam side, just like Our Conor was. All the best Jeremy progeny over hurdles - Our Conor, Stocktons Wing, Fisher, Goodwood Mirage, and on - have had stamina influences in the dam side of the pedigree. Our lad is out of a Dalakhani mare, a fine influence for stamina. Indeed, Dalakhani mares have been responsible for very few National Hunt runners so far, but they have tended to produce quality rather than quantity. Of the five hurdlers to have run in Britain and Ireland out of Dalakhani mares, two were multiple winners and two placed second. The other was rated 51 on the flat at its best, compared to our top of 80 and current mark of 75. Those two winning hurdlers weren't just any old hurdlers either. One was Zarib, Dan Skelton's dual winner who ran sixth in the Fred Winter at the Cheltenham Festival in March... and the other was Nichols Canyon. That one won five out of seven last term, including an incredible four Grade 1's! The boy is 16 hands, a good size, has lots of bone and moves well. Below is some video of him walking, cantering and schooling. He seems to be a pretty natural hurdler, and has plenty of upside potential to make into a really nice timber-topper and, potentially, dual purpose horse. As always, I like to keep things as affordable as possible, but you are buying into a racehorse, and such animals are 'not cheap'. The cost of the horse, transport from Ireland to Dorset, and four months (July to October) stabling and training he's received prior to our monthly obligations starting is more than the £20,000 for which he's been acquired. Monthly payments, from November 1st, of £100 per month. There are no 'admin fees' or hidden costs with this, or any of my syndicates. 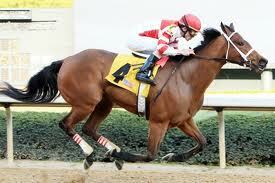 The 'kick back' for me is that the horse will run in the colours of geegeez.co.uk. I have added an extra £100 to the base price to cover insurance costs, and all funds are held in the account and will be distributed between members at the end of the term. The term of the syndicate will be an initial two years, and you can read a draft copy of the syndicate agreement here. In summary, it is £1,100 up front and then a monthly standing order/direct debit for £100 starting on 1st November. The monthly payment covers training, feed, stabling, shoes, minor medicines, minor vet's bills, racecourse transit, race entries, and jockey fees. So it's all inclusive, barring significant unforeseen incidents (those that would cost more than £100 per syndicate member to address). In those cases, we discuss as a syndicate what to do. As well as outright ownership of a 1/20th share of the horse, you will receive owners' badges every time he runs. You'll also be able to visit him at the stables, either as part of a group get-together or when you're in the area (by prior arrangement, obviously). All owners will receive an equal share of any prize money, which is divvied up at the end of the initial two year term. And you get to buy into the dream of having a horse that might - just might - be good enough to race in big Saturday contests or even, whisper it, at the Cheltenham Festival. I'm obviously not promising that - far from it - but that's where we'd love to be headed. All owners have a say in any significant decisions affecting the horse/syndicate. For day-to-day operations, that's left to the trainer (Anthony) and the syndicate manager (me). Naturally, we keep members in the loop with regular updates on progress, entries, chances and so on. I'm really excited about this lad. He's a pretty straightforward sort who is ready to race (actually had an entry on the flat this week but I requested him not to run). And the fact that he's got the ability to run competitively in all weather races gives us a really nice alternative option. If you'd like to join the syndicate - which will run for a minimum term of two years, please email me by clicking here. I will be seeking fees for the horse pretty much straight away (I'll have to pay for him no later than early next week, so will be 'in the hole' in the short term) - if you need to pay over a couple of instalments, we can discuss that, no problem. And I will ask members to sign and email/post the last page in our syndicate agreement when they come on board. Really looking forward to getting started, and I'm excited to share this prospect with a very knowledgeable group of racing fans. One last thing: if there's anything I haven't answered in this post, and isn't in the syndicate agreement above, leave a comment below and I'll be happy to help if I can. 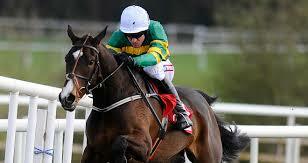 Jezki - Champion Hurdle contender? Sgt Reckless - Richard Hughes Festival ride?